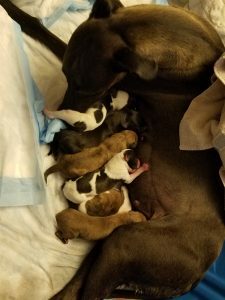 Jasmine’s first litter arrived in the early hours of September 7, 2017! 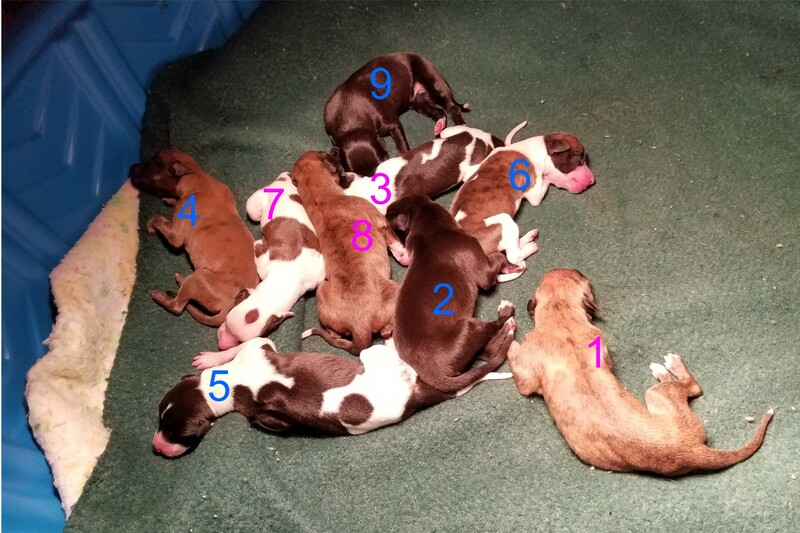 A crazy quilt of Moki x Jasmine pups, marked by birth order and gender, at a little over 24 hours old. 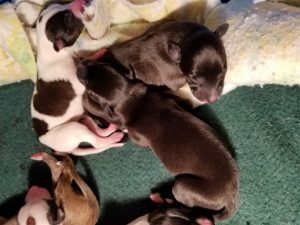 Jasmine’s temperature was dropping on the morning of September 8th, a sign that she would soon whelp, and by early evening, we were in full “puppy watch” mode, monitoring her carefully. 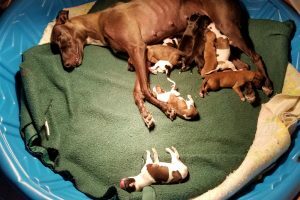 She was fully determined to give birth in the XL cozy cave bed in our living room, so we had to put it up and really work to get her to stay in the kiddie pool we had prepared. 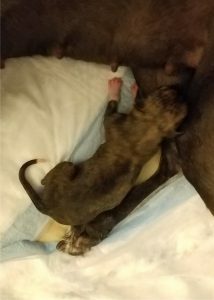 I discovered that she was more calm if I kept her mostly covered, creating a “cozy cave” feel for her, so I spent the evening and most of the night holding a blanket over her and trying to watch her face and rear end at the same time. 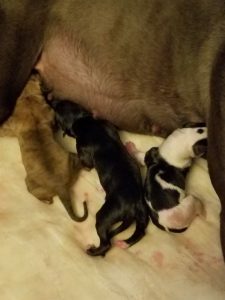 It was a unique experience, for sure! 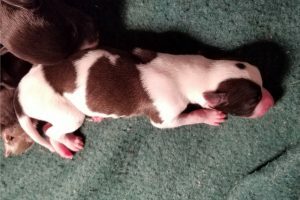 Another unique thing about this litter for us was that all of the puppies came nose first. Every single one! Labor progressed, and the clock passed over into September 7th as we waited. The first puppy made her grand entrance and 1:00 a.m., and we were kept fairly busy until after the last one appeared at 6:40 a.m. 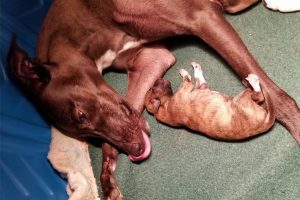 There was a third unique happening with Jasmine’s whelping: first, about 20 minutes after the 8th pup she insisted on going outside, so Bill took her out while I worked on cleaning up and changing her bedding, and as he was bringing her back in, she stopped to deliver a placenta (this is a normal thing); about 10 minutes later, as we were trying to get her to settle back in the pool, she insisted on going back out, so Bill took her again… and… she surprised him by squatting to deliver a puppy on the porch! He quickly caught the little one, grabbing a towel from the porch (kept there for the dogs), and ran him in to me for more attention while Bill got Jasmine back in. 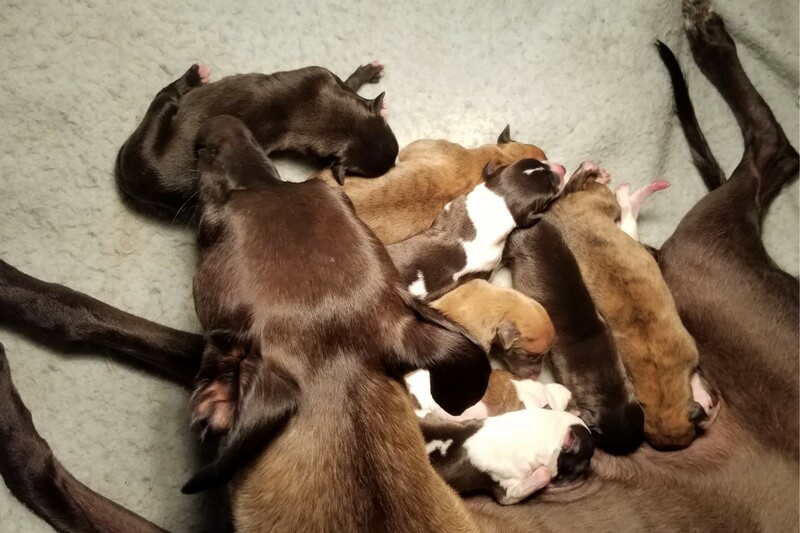 Never a dull moment around here! All in all, Jasmine handled her whelping well, and is very proud of her puppies, as are Bill and I! *Note: my “old faithful” scale turned out to not be so faithful after all, so the weights were taken several hours later, after we acquired a new one. 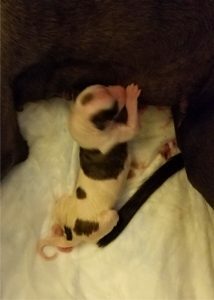 Puppy #1, girl, born at 1:00 a.m., 13.1 oz. 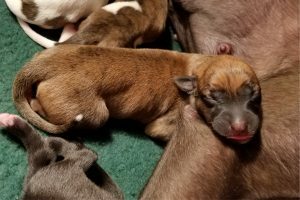 Puppy #2 (center), boy, born at 2:07, 14.1 oz. ; and Pup #3, girl, at 2:11, 9.9 oz. Puppy #4, boy, at 2:25, 9.7 oz. 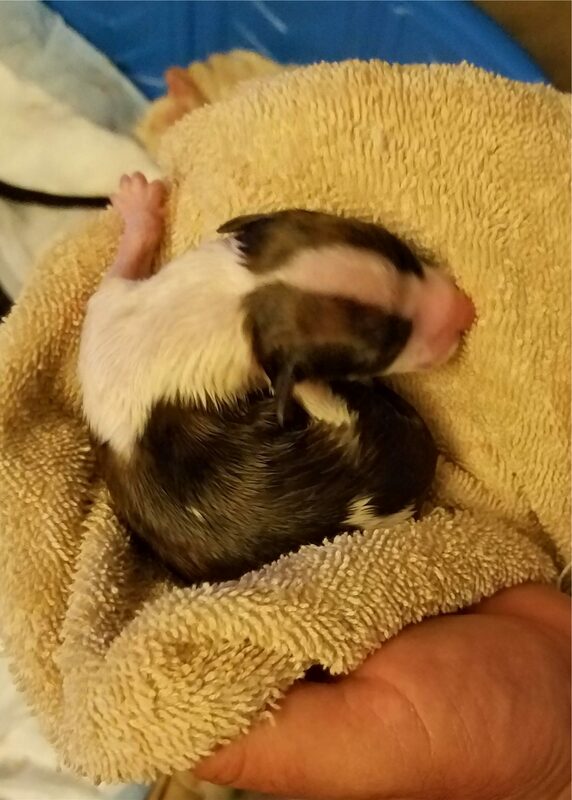 Puppy #5, boy, at 2:56, 12 oz. 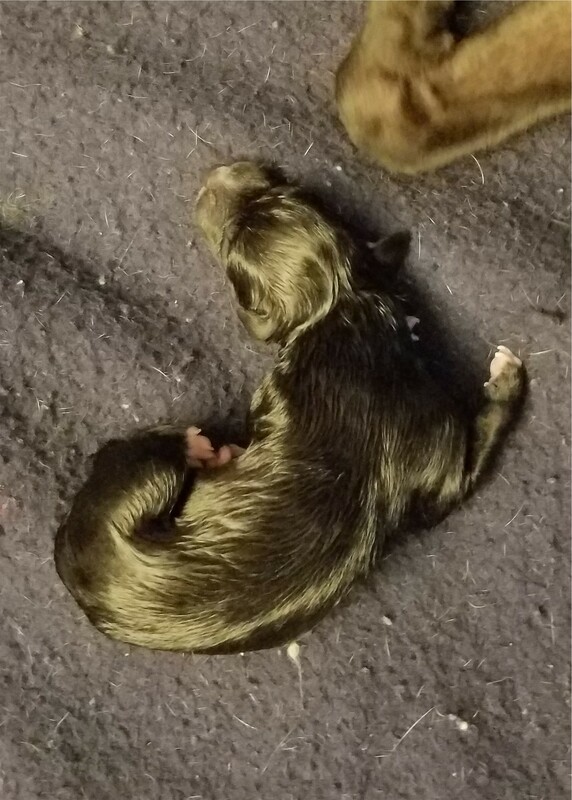 Puppy #6, boy, at 3:30, 9.6 oz. The first six puppies getting baths at the milk bar, while the rest were getting lined up to join them. 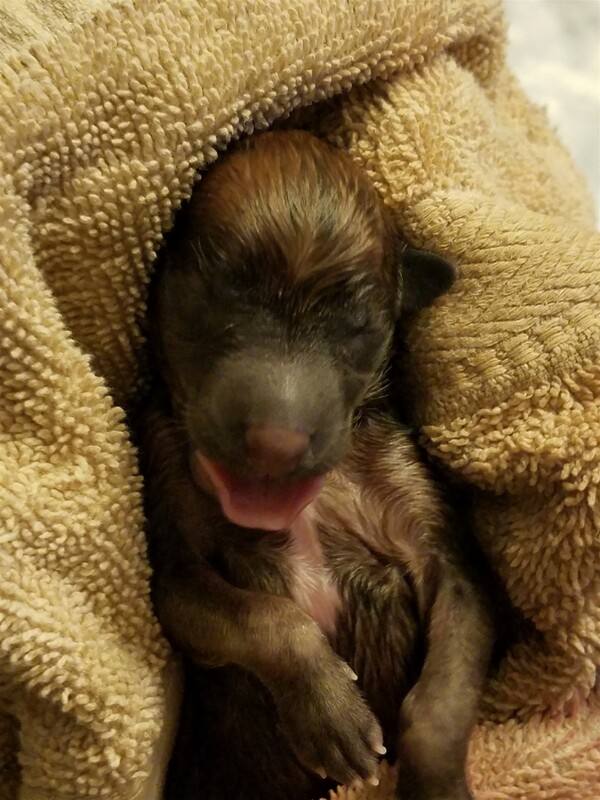 Puppy #7, girl, at 4:36, 10.6 oz. 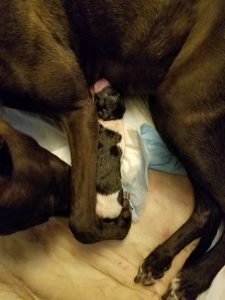 Puppy #8, girl, at 5:53, 12.8 oz. Puppy #9, born at 6:40 a.m., 12.8 oz. Jasmine and her beautiful brood all cleaned up and getting settled. Pretty #1, Jasmine’s first born, showing off her cute tail tip. Time will tell whether our two sleek black boys, #2 (top) and #9, will turn out to be seal like their mama. We were surprised to see all the white on adorable #3, who was eventually joined by three more parti-colored siblings. 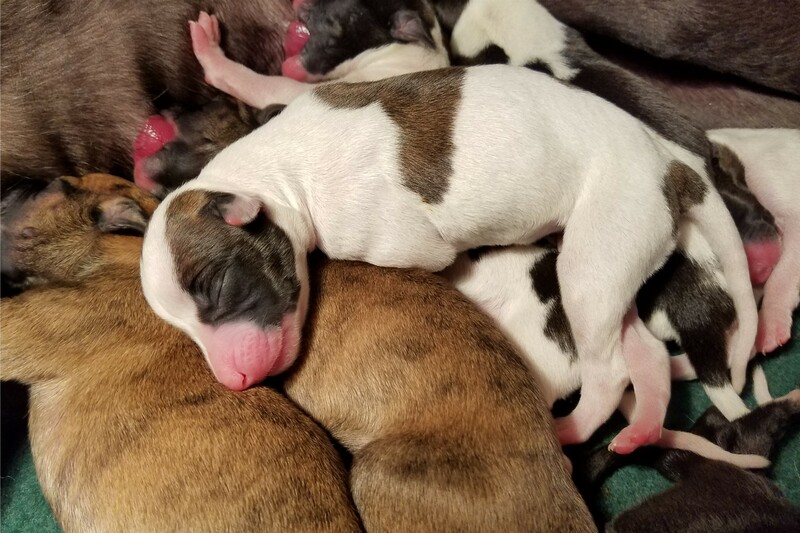 The only white we can see on little brindle boy #4 is a short stripe on his chest, telling us he’s really number 1, and #5 is super cute with that tiny stripe on his forehead. Flashy #6 was the smallest at birth, but I’m sure he won’t be for long. 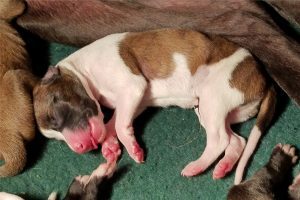 Sweet little #7 with her angel wing marking. 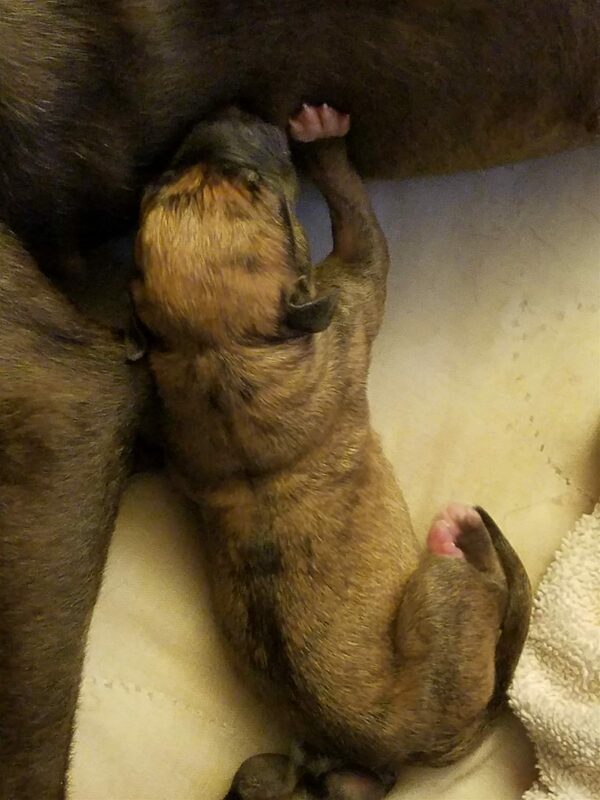 Pup #8 looks like she’s wearing socks. 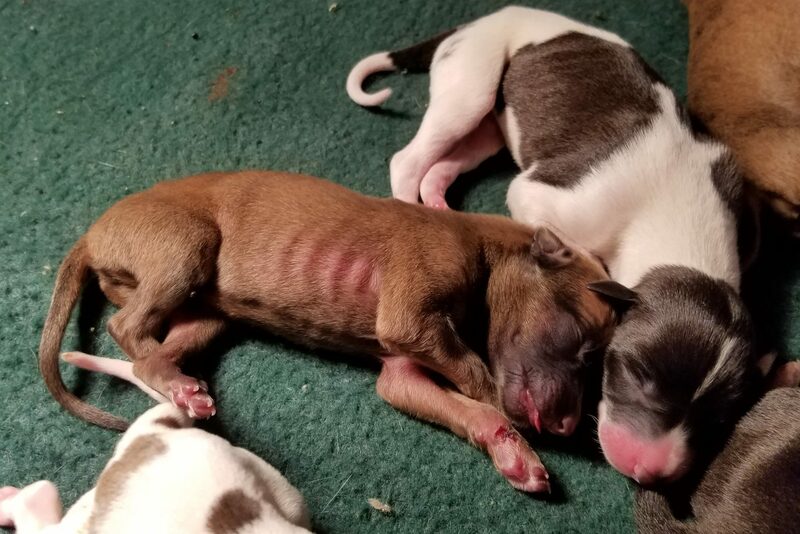 The whole crew, basking in the warming light. So precious!